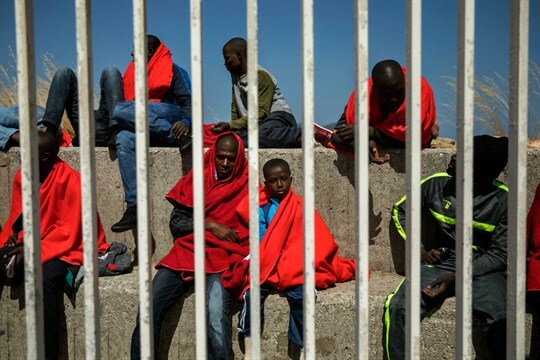 Migrants wait to be transported to a police station after being rescued in the Strait of Gibraltar, Algeciras, Spain, June 26, 2018 (AP photo by Emilio Morenatti). Roughly 300 people will wade into the shallow water off the coast of Libya today, moving under the cover of night and according to the shouted instructions of their smugglers. Most will have come from sub-Saharan nations like Nigeria and Eritrea, having traveled for months along a route plagued by armed gangs and predatory police for the opportunity to climb into a rubber raft and float toward a future in Europe and beyond. In 2016 and 2017, nearly 8,000 migrants drowned while attempting this dangerous Mediterranean crossing.